Search Results for "grape harvest"
Collecting grapes. Grape harvest. Kid's hand plucking grape. Child's hand breaking the vine. Juicy fresh branch of grapes handing on a grape vine. Water drops on green fruits. Fresh juicy fruits. Ripe Vineyard Grapes. Grapes Vineyard Sunset. Tuscany, Italy. Italian Wineyard: Ripe Grapes On The Vine For Making White Wine. 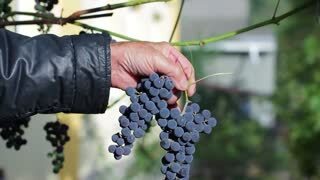 Wine Grapes Harvest In Italy. Italian Countryside Beautiful Vineyards. Vineyard wine grape harvest woman farming picking ripe grapes fruits for white wine. Closeup of hand holding bunch of green grapes on grapevine. Ellenz, Rhineland-Palatinate/ GERMANY September 04 2017: wine harvest on vineyard at Mosel river Germany. Mechanical harvesting with self-propelled grape harvester. filling grapes on tractor trailer.